1. Our specially designed silicone pastry mat measures Large(23.6''X15.7'') Small(11.4''X10.2''),the pastry mat is outlined with inch and centimeter ruled guides, you can use recipes from all over the world and not worry about unit conversions. 2. It has 5in to 12 in diameter circular makings for crafting pies,tortillas,ect. 4. Silicone pasty mat is very easy to clean, with warm water and soap,can also be placed in the dishwasherm,and let air dry ,best stored flat or rolled up. 5. Ideal for kneading,rolling,and shaping breads,pizza dough's,pastas,pastries,pie crusts and fondants.Provides a clean extra large baking or cooking preparation surface,makes the perfect gift. Why choose the Silicone Baking Mat? *Heat safe baking mat can be used in the oven or microwave as a liner for your cookware. *Nonstick surface lets you skip greasing! *Design includes weight, temperature & metric conversions. Your satisfaction is guaranteed. Click the "Add to Cart" button to Order Now for a truly enjoyable baking experience. 2． Non-stick surface:Easy to work with any dough and no need cooking sprays,parchment paper and eliminate the use of excess flour. Non-skid: Sticks to your countertop for easy dough handing. 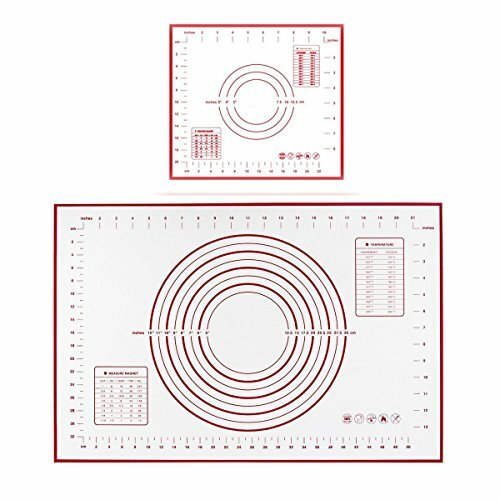 3． Easy measuring: pastry mat with conversion measurements ,easy convert from US to imperial.Now you can use recipes from all over the world and not worry about unit conversions .It has 5in to 12 in diameter circular makings for crafting pies,tortillas,ect. View More In Baking Mats. If you have any questions about this product by Polkar, contact us by completing and submitting the form below. If you are looking for a specif part number, please include it with your message.